The phylogenetic position of the Protura, traditionally considered the most basal hexapod group, is disputed because it has many unique morphological characters compared with other hexapods. Although mitochondrial genome information has been used extensively in phylogenetic studies, such information is not available for the Protura. This has impeded phylogenetic studies on this taxon, as well as the evolution of the arthropod mitochondrial genome. 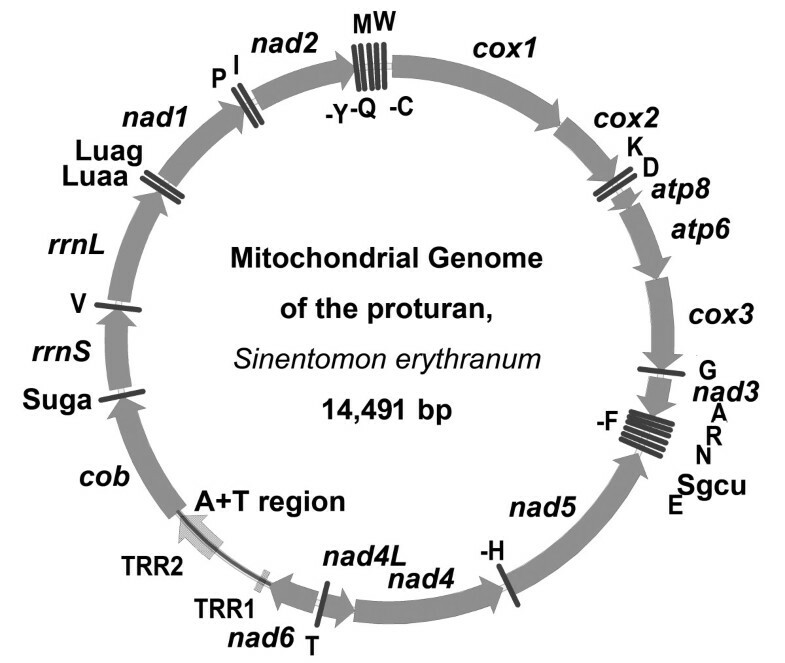 In this study, the mitochondrial genome of Sinentomon erythranum was sequenced, as the first proturan species to be reported. The genome contains a number of special features that differ from those of other hexapods and arthropods. As a very small arthropod mitochondrial genome, its 14,491 nucleotides encode 37 typical mitochondrial genes. Compared with other metazoan mtDNA, it has the most biased nucleotide composition with T = 52.4%, an extreme and reversed AT-skew of -0.351 and a GC-skew of 0.350. Two tandemly repeated regions occur in the A+T-rich region, and both could form stable stem-loop structures. Eighteen of the 22 tRNAs are greatly reduced in size with truncated secondary structures. The gene order is novel among available arthropod mitochondrial genomes. Rearrangements have involved in not only small tRNA genes, but also PCGs (protein-coding genes) and ribosome RNA genes. A large block of genes has experienced inversion and another nearby block has been reshuffled, which can be explained by the tandem duplication and random loss model. The most remarkable finding is that trnL2(UUR) is not located between cox1 and cox2 as observed in most hexapod and crustacean groups, but is between rrnL and nad1 as in the ancestral arthropod ground pattern. The "cox1-cox2" pattern was further confirmed in three more representative proturan species. The phylogenetic analyses based on the amino acid sequences of 13 mitochondrial PCGs suggest S. erythranum failed to group with other hexapod groups. The mitochondrial genome of S. erythranum shows many different features from other hexapod and arthropod mitochondrial genomes. It underwent highly divergent evolution. The "cox1-cox2" pattern probably represents the ancestral state for all proturan mitogenomes, and suggests a long evolutionary history for the Protura. The Protura is a group of mysterious soil-dwelling micro-arthropods (usually 0.5-2.0 mm in length), first described by Silvestri in 1907 . Traditionally, it was regarded as a basal hexapod group, but it owns many unique and primitive morphological characteristics compared with other hexapods. For example, they lack antennae and wings, the foretarsus are enlarged with many sensilla serving the role of antennae, eyes and tentorium are absent, they have anamorphic post-embryonic development, and they have 12 abdominal segments (instead of 11) . The proturan spermatozoan has a variable number of doublet microtubules (9-16), with no accessory or central microtubules. It is different from those of other hexapods, but similar to the sperm of sea spider (Arthropoda: Pycnogonida). This probably reflects a high diversification rate, or a lengthy evolution [3–5]. Historically, there were many controversies about the relationship of proturans to other hexapods, and their evolutionary position in the Arthropoda [2, 3, 6–9]. This is because proturans are understudied, being so small and rare, making them difficult to collect, identify, culture and experiment on [2, 10, 11]. The higher-level phylogeny of the major arthropod groups (Chelicerata, Myriapoda, Crustacea and Hexapoda) continues to be a matter of debate despite extensive research based on phylogenetic analysis and genetic data [12–14]. Almost all molecular analyses strongly support the Pancrustacea hypothesis: crustaceans, instead of myriapods, are the closest relatives of the hexapods [15–18]. The Hexapoda (Insecta s. lat. ), which includes four groups, Protura, Collembola, Diplura and Insecta (Insecta s. str. ), was traditionally considered a monophyletic lineage based on the synapomorphies of body segments, six legs on the thorax, and adaptation to the terrestrial environment. The monophyly of the Insecta has been well established by morphological and molecular studies [8, 10, 17, 18], but the monophyly of the Hexapoda is less certain [17, 19]. Three basal hexapod groups (Protura, Collembola and Diplura) show many different features from insects according to morphology [10, 20] and ultrastructure of spermatozoa . The mitogenomic data of basal hexapod collembolans and diplurans reject the monophyly of Hexapoda, and suggest that some crustaceans are more closely related to the Insecta than Collembola and Diplura [17, 19, 21]. However, recent studies based on EST data and nuclear genes (18S and 28S ribosomal RNA genes, nuclear protein-coding sequences) support the monophyly of the Hexapoda [12, 13, 18]. The arthropod mitochondrial genome is a single circular DNA molecule encoding 13 proteins, 22 transfer RNAs (tRNAs), two ribosomal RNAs (rRNAs), and one A+T-rich region for the control of replication and transcription of the mtDNA. It is used extensively for studying phylogenetic relationships at various taxonomic levels. Unlike nuclear molecular markers, mtDNA is of maternal inheritance, and does not experience intermolecular genetic recombination. In addition, the mitochondrial gene order can provide additional phylogenetic information, since rearrangements appear to be generally rare events, and most mitochondrial gene arrangements often remain unchanged over a long evolutionary period . Mitogenomic data also strongly support the Pancrustacea hypothesis [14, 17, 23], especially with the evidence of the gene order [16, 24]. The gene trnL2 (UUR) is located between rrnL and nad1 in the ancestral arthropod ground pattern, but is translocated to the position between cox1 and cox2 in Pancrustacea . It has been considered a distinctive synapomorphic character for crustaceans and hexapods. The mitochondrial genomes of basal hexapod Collembola  and Diplura  also agree with the "cox1-trnL2-cox2" pattern. So far, no mitochondrial genome information is available for the Protura. This has impeded comprehensive discussions on the evolution of the arthropod mitochondrial genome, and the validity of using mtDNA to study the phylogeny of the Hexapoda [27–29]. In this study, we sequenced the complete mitochondrial genome of Sinentomon erythranum (Protura: Sinentomata: Sinentomidae), to describe the molecular features of the proturan mitochondrial genome, to judge how these evolved, and to see if it has any phylogenetic information, which may help resolve the discrepancy on the monophyly of the Hexapoda between mitochondrial and nuclear DNA markers. The mitochondrial genome of S. erythranum (GenBank accession HQ199311) encodes 37 genes, which is consistent with metazoan mitochondrial DNA structure (Figure 1 and Table 1). However, the total size of the genome is only 14,491 base pairs, smaller than most hexapod mitochondrial genomes, but similar in size to those of some spiders and mites (for example, the spider Habronattus oregonensis 14381 bp, NC_005942). Most of the genes are encoded by the majority strand (J-strand, Simon et al. ), and only eight genes are encoded by the opposite strand (N-strand): five tRNAs and three protein-coding genes (PCGs) (nad5, nad4, nad4L). The gene order differs from that of the mitochondrial genomes of all sequenced arthropods, and most tRNA genes are reduced (Table 1). trnW-uca is the largest tRNA with 68 nucleotides, and the shortest tRNAs have only 53 nucleotides (trnA-ugc, trnH-gug, trnV-uac). The average size of all 22 tRNAs is less than 57 nucleotides. All 13 PCGs have the typical ATN start codon, and have either complete (TAA or TAG) or incomplete stop codons (TA (A), TA-, T--). The incomplete stop codons are presumably polyadenylated after transcription to form complete TAA stop codons . The stop codons of several PCGs have an adenine (A) overlap with the next PCG's start codons. Such overlap is located at the junction of cox1/cox2, atp8/atp6, atp6/cox3 and nad4L/nad4 (Table 1). Mitochondrial genome organization of S. erythranum. Protein-coding and ribosomal RNA genes are indicated with standard abbreviations, transfer RNA (tRNA) genes are designated by a single letter for the corresponding amino acid except for those coding for leucine and serine, which are labeled with their anticodon as well (Luag, Luaa, Sgcu and Suga). Arrows indicate direction of coding regions either on the J-strand (clockwise, 29 genes) or the N-strand (counterclockwise, eight genes) (after Simon 2006). The five tRNAs encoded by the N-strand are indicated by a (-) sign (for example -F). A+T region refers to the non-coding region that may be related to the regulation of mitochondrial replication and transcription. TRR stands for tandemly repeated region. Strand asymmetry (also called strand composition bias) is a remarkable feature of animal mitochondrial genomes. The overall mitogenomic AT-content of S. erythranum is 77.6%, which shows a strong bias towards A and T, and is well within the normal range of arthropod mtDNAs. The nucleotide frequency of the J-strand is T = 0.524, A = 0.252, G = 0.151, C = 0.073. Therefore, T is much more abundant than A, and G is more abundant than C. The AT-skew and GC-skew of the J-strand for S. erythranum are -0.351 and 0.350, respectively. They are extreme and reversed compared with those of most arthropods, which instead have a positive AT-skew and negative GC-skew (Figure 2A). The reversed value of AT-skew and GC-skew may indicate altered replication orientation of mtDNA in the A+T- rich region . The skew value is the farthest of all from the coordinates (Figure 2A), meaning this proturan mitogenome has the most biased nucleotide composition ever reported for arthropods. The mitogenomic AT-skew value of S. erythranum (-0.351) is the most negative of all reported mitochondrial genomes, much lower than the second most-negative value from the American house dust mite Dermatophagoides farinae (NC_013184, AT-skew -0.253). For GC-skew, only the values of the small pigeon louse Campanulotes bidentatus (NC_007884, GC-skew 0.381) and tarantula Calisoga longitarsis (NC_010780, GC-skew 0.365) are slightly higher than the 0.350 of S. erythranum. It is unusual to find so many poly Ts within mitochondrial protein-coding sequences. For instance, a poly T motif in cox3 contains 27 continuous Ts, which results in the frequent use of TTT (F) codons. The exact reason for the occurrence of this motif remains unknown. In any case, the mitogenomic sequence of S. erythranum should be a good model for studying the mechanism of the base-frequency bias. Severe strand asymmetry of the mitochondrial genome sequence of S. erythranum. A. Scatterplots of skew values calculated for the whole majority strand for 360 arthropods. The value for S. erythranum (-0.351, 0.350) is indicated by the triangle at left, with the other arthropods represented by diamonds. B. Nucleotide composition (center), AT-skew (below) and GC-skew (above) of all 13 PCGs and two ribosome RNA genes of the S. erythranum mitogenome. All values are calculated for the majority strand. 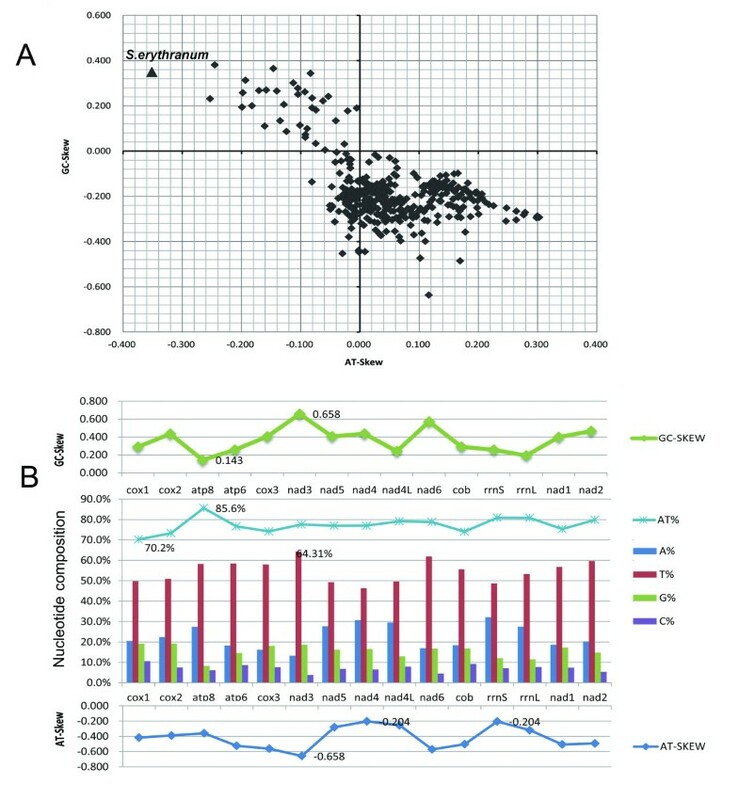 Figure 2B shows the nucleotide composition, AT-skew and GC-skew for each of the 13 PCGs and two rRNA genes of the mitochondrion of S. erythranum. Cox1 has the lowest AT content (70.2%) and atp8 has the highest AT content (85.6%). The AT content of these 15 genes does not fluctuate far from the overall average AT content (77.6%). Nad3 has the most negative AT-skew (-0.685), and nad4 and rrnS share the least extreme AT-skew (-0.204). The AT-skew values of the adjacent genes nad5, nad4 and nad4L are less extreme than in other adjacent genes, and all three of these genes are encoded by the minority strand, so it seems that some constraints shaped the genome that evolved under a strong directional mutation pressure (Figure 2B) . The largest non-coding region (993 bp, Table 1), named the A+T-rich region in arthropods, is located between nad6 and cob (Figure 1), with a very high A+T content of 91.4% (Figure 3). There are two G-stretches (consisting of seven Gs each) at 5' of the A+T-rich region. The A+T-rich region contains two tandemly repeated regions (TRRs): TRR1 (11 × 10 bp) and TRR2 (13.7 × 35 bp). The repeat units are 'TTTTGTTAAA' for TRR1 and 'TACTTATAATGTAAAATATTTAATATCAATTTAAA' for TRR2. All 11 repeat units are exactly the same in TRR1, but for TRR2, only 11 repeat units are identical. Both TRRs can form stable stem-loop secondary structures (bottom of Figure 3). We noticed that the length of the A+T-rich region shows heteroplasmy at an intraspecific level . Three kinds of length variations were detected by PCR amplification of the A+T-rich region from different individuals. The length heteroplasmy of the A+T-rich region is further confirmed by sequencing the PCR products after cloning. The copy number of TRR2 does vary in different individuals. 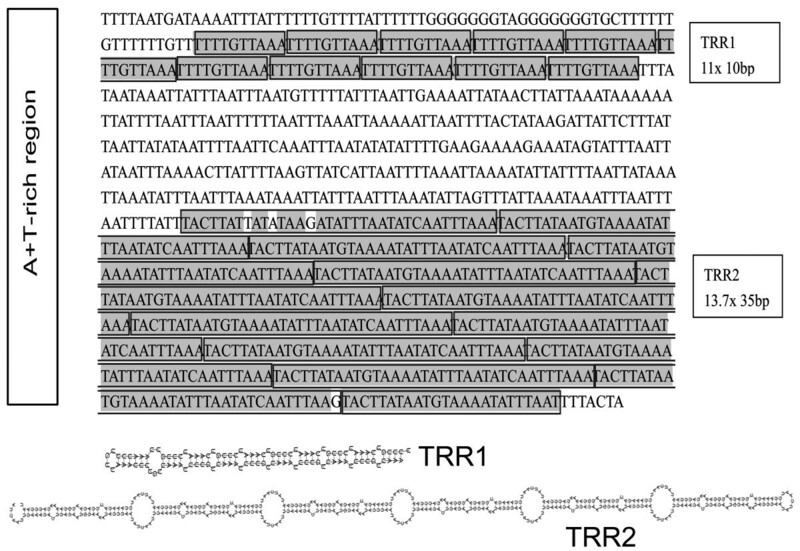 Sequences of the A+T-rich region, primary and secondary structures of tandemly repeated regions (TRR): TRR1 (11 × 10 bp) and TRR2 (13.7 × 35 bp). In TRR2, the nucleotides that are not exactly same as the consensus pattern are shown in white background color. The predicted secondary structures indicate that most tRNAs in our sequence have truncated structures (Figure 4). 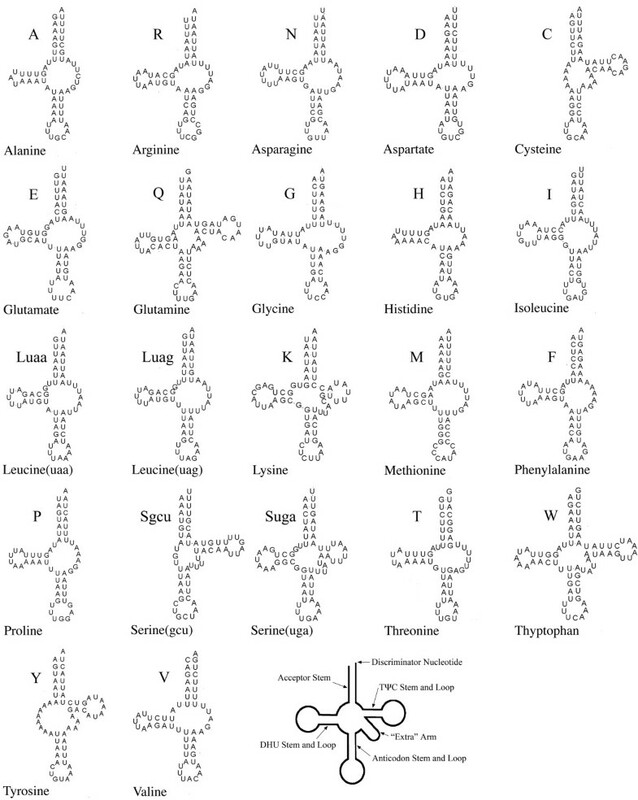 Among the 22 tRNAs, 15 of them lack a TΨC loop, and trnS-gcu, trnY and trnC lack the dihydrouridine (DHU) arm. The lack of the DHU arm in trnS-gcu is very common in metazoan mitochondrial genomes [35, 36]. trnC is coded by the J-strand and shares 18 nucleotides with trnW, which is coded by the N-strand. Studies on nematode mtDNAs have proven that extremely reduced tRNAs, like those of S. erythranum, can function properly [37, 38]. The extensive loss of the cloverleaf structures of tRNAs has been found in many groups of nematodes and arachnids [35, 39, 40], but to our knowledge, so many abnormal tRNA secondary structures within one mitochondrial genome have only been detected in very few hexapods, such as gall midges (Diptera: Cecidomyiidae) . This suggests the independent origin of these truncated tRNA structural features in S. erythranum [38, 41]. Inferred tRNA secondary structures in the mitochondrial genome of S. erythranum. Compared with the arthropod ground pattern (e.g. Limulus polyphemus), 11 of 37 genes in our proturan sequence have been rearranged: eight tRNA genes (trnF, trnV, trnL2, trnL1, trnP, trnY, trnQ, and trnM), two rRNA genes (rrnS and rrnL) and one PCG (nad1). The rearrangements can be divided into five categories (Figure 5): 1) the translocation of trnF; 2) the remote translocation and inversion of trnP; 3) the local inversion of the gene block (rrnS, trnV, rrnL, trnL2, trnL1, and nad1); 4) the reshuffle of the tRNA gene region from trnI to trnC; 5) the relocation of the A+T-rich region. Mitochondrial gene rearrangements in S. erythranum mtDNA compared with the ground patterns of Arthropoda and Pancrustacea, and the examination of the tandem duplication and random loss (TDRL) hypothesis. Gene sizes are not drawn to scale. Genes encoded by the reverse strand are indicated by a dark line under the gene name with blue shadow. Red areas indicate genes that were rearranged, and circle arrows indicate inversion. The rearrangements are divided into five categories: 1) the translocation of trnF; 2) the remote translocation and inversion of trnP; 3) the local inversion of the gene block (rrnS, trnV, rrnL, trnL2, trnL1, and nad1); 4) the reshuffle of tRNAs region from trnI to trnC, which is compatible with the TDRL hypothesis; that is, duplication of the ancestral gene block from trnI to trnY can get the exact order of S. erythranum's mtDNA in this region after loss of shadowed genes; 5) the relocation of the A+T-rich region. Rearrangements 1 and 2: the translocation of trnF may be an independent event, and this kind of minor rearrangement is very common in mtDNA [42, 43]. The trnP changed its coding strand from N to J during its "long range" translocation, and this situation is rarely reported. Rearrangements 3 and 4: The tandem duplication and random loss (TDRL) model is a popular hypothesis for explaining many mtDNA gene rearrangements [44–46]. Here, it can readily explain the reshuffling of tRNAs in the region from trnI to trnC (rearrangement 4 in Figure 5), although it does not explain the gene inversion (rearrangement 3 in Figure 5). For that inversion, the implication is strong that the gene block "rrnS-V-rrnL-trnL2-trnL1-nad1" was locally reversed as a whole. Gene inversions are probably the result of intra-molecular recombination, which can not only rearrange parts of the genome but also invert them at the same time. In the mitogenomic sequence of S. erythranum, both gene relocation and inversion must have occurred, although it is uncertain which of these two processes dominated. Here, we have some new thoughts. For the TDRL model, gene duplication is necessary, which can be achieved by replication slippage in single stranded templates. At the same time, a loop must be produced by slippage, so it is possible for the loop to perform intra-molecular recombination simultaneously . Namely, the reshuffling of tRNAs and local inversion of a gene block may happen together in a stepwise rearrangement process. We further checked available mitochondrial genomes, and found that recombination involving PCGs has rarely occurred in hexapods, except in some lice whose mitochondrial genomes were extensively shuffled . Rearrangement 5: it is not easy to explain the translocation of the A+T-rich region. There is a hint of an orientation change of replication due to the nucleotide-bias change from the majority type (AT-skew and GC-skew) (Figure 2A), but it is hard to explain it as a consequence of the inversion of gene block "rrnS-V-rrnL-trnL2-trnL1-nad1". The mitochondrial gene order of S. erythranum differs greatly from the pancrustacean ground pattern (Figure 5). The most remarkable finding is that trnL2 is not located between cox1 and cox2. The "cox1-trnL2-cox2" pattern was supposed to be a strong molecular evidence to support the Pancrustacea hypothesis . trnL2 is located between rrnL and nad1 in the arthropod ground pattern, but is translocated to the position between cox1 and cox2 in crustaceans and hexapods. In our proturan sequence, trnL2 is found between rrnL and nad1, adjacent to trnL1 (trnL-tag). This is almost, but not quite, the arthropod ground pattern, that is, given the premise that the gene block "rrnS-V-rrnL-trnL2-trnL1-nad1" inverted as a whole, trnL2 and trnL1 must have changed their relative position compared with the arthropod ground pattern (Figures 5, 6). The gene sequences of trnL2 and trnL1 of S. erythranum are very similar (78% sequence identity, see detailed comparison between trnL1 and trnL2 in Additional File 1), so probably one trnL was copied from the other. This process can be explained by a mutational remolding hypothesis [49–51]. More mispairs appear in trnL-uag (trnL1) than in trnL-uaa (trnL2) (Additional File 1), so the trnL-uaa (trnL2) was most likely duplicated, and then one of the copies changed to trnL-uag by a random point-mutation of the anticodon triplet. After that, the original tRNA gene would have become a pseudogene or degenerated, so that the new trnL-tag replaced its function next to trnL-taa. In general, it cannot get a right paired tRNA duplicate from a wrong template, so we consider this as an evidence that trnL2 located between rrnL and nad1 is the ancestral state. Mitochondrial genomes of other basal hexapods (Diplura and Collembola) match the pancrustacean pattern of cox1-trnL2-cox2 [25, 26]. Thus, the proturan S. erythranum is the only known hexapod whose trnL2 is in the ancestral arthropod position. Statistics and comparison of mitochondrial trnL2 patterns in all published mitochondrial genomes of arthropod lineages (until January 16, 2011). The ratios above the branches indicate the number of taxa with gene regions consistent with the pattern to the whole number of taxa whose mitogenomes are published. The Protura has three groups: Acerentomata, Sinentomata and Eosentomata. Besides S. erythranum, a member of the Sinentomata, we also sequenced the cox1/cox2 region (about 1.4 kb) from Baculentulus tianmushanensis of Acerentomata (GenBank accession HQ416715), Eosentomon nivocolum of Eosentomata (GenBank accession HQ416716), and Zhongguohentomon piligeroum of Eosentomata (GenBank accession HQ416714). They all agree with the cox1-cox2 pattern and have no intervening trnL2. In addition, cox1 is the exact neighbor to cox2 with no nucleotide between them in S. erythranum, B. tianmushanensis and E. nivocolum, and only four intergenic nucleotides in Z. piligeroum. Therefore, based on the available data, we believe it is more reasonable to conclude that the ancestral state is the cox1-cox2 pattern for all proturan mtDNAs. The "cox1-trnL2-cox2" pattern occurs in almost all hexapods. 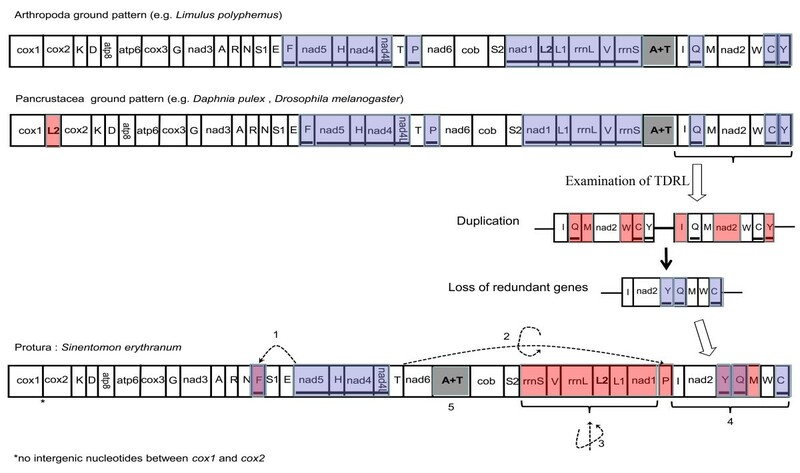 We compared all published data of arthropod mitogenomes (available until January 16, 2011), and found only eight of 226 mtDNAs of Insecta are not consistent with this pattern (Figure 6 and Additional File 2), but they are clearly secondary mtDNA rearrangements or with multiple trnL2 copies. Five of them are from the Hemiptera, three parasitic lice from the Phthiraptera (Bothriometopus macrocnemis, C. bidentatus compar and Heterodoxus macropus) [52, 53], one bark louse from the Psocoptera (Lepidopsocid sp. RS-2001) and one species from the Thysanoptera (Thrips imaginis) . Their mitochondrial gene arrangements are reshuffled rigorously. The other three exceptions are from the Hymenoptera (Vanhornia eucnemidarum, Abispa ephippium and Diadegma semiclausum) . It was noticed that in Hymenoptera, tRNA rearrangements (termed minor rearrangements) are very common, especially in the hot-spot areas . In Abispa ephippium, trnL2 has four copies, but is still located between cox1 and cox2 . However, most hemipteran and hymenopteran mtDNAs are still consistent with the cox1-trnL2-cox2 pattern. In Crustacea, only nine of 60 mitochondrial genomes are not consistent with the cox1-trnL2-cox2 pattern (Additional File 2). In addition, only seven of 53 mitochondrial genomes from the Chelicerata are not consistent with the cox1-cox2 pattern (Additional File 2), and all eight reported mitochondrial genomes from the Myriapoda are consistent with the cox1-cox2 pattern (Figure 6). These statistics reflect the fact that translocation of trnL2 out of the cox1/cox2 junction has rarely happened within Pancrustacea lineage, and no case of the cox1-trnL2-cox2 pattern was detected within Myriapoda and Chelicerata lineages, whose trnL2 tends to stay between rrnL and nad1. This information leads to a single plausible scenario of the ancestral state being cox1-trnL2-cox2 in the Hexapoda, but the proturan mitochondrial genomes likely retain the ancestral state of the Arthropoda, the cox1-cox2 pattern. This seems to cast new doubt on the monophyly of Hexapoda. The Protura probably has a very ancient origin and a long evolutionary history, with distant affinity to other hexapods, evolving even earlier than other pancrustaceans. However, we cannot exclude the possibility of the secondary reversion to the primitive arthropod condition in the proturan ancestor since our gene sequence is so highly divergent. In this case, the mtDNA of S. erythranum provides a remarkable example of secondary reversion. 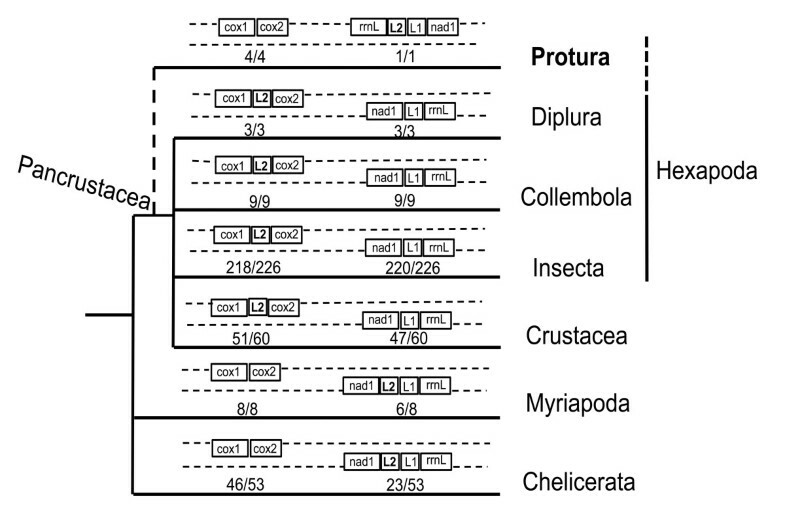 Since the position of trnL2 cast doubt on the relationship between the Protura and other hexapods, it is important to verify it with a phylogenetic tree. 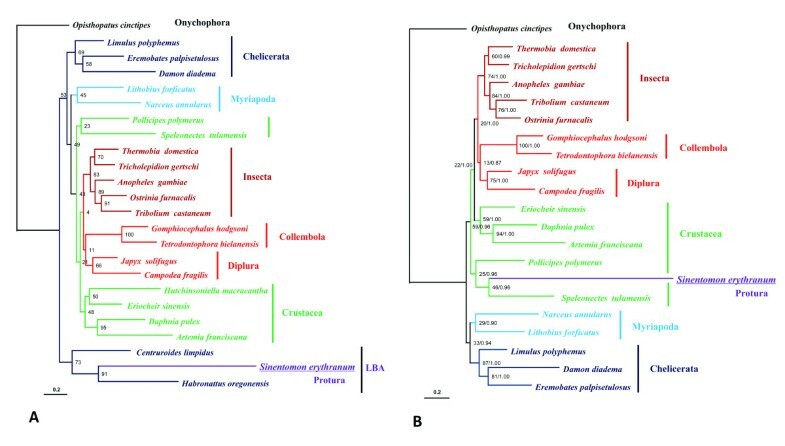 As revealed in Figure 2A, the base composition of S. erythranum is so different from that of most arthropod mitochondrial genomes, long-branch attraction (LBA) can be expected. Translating the PCGs into amino acid sequences is an effective method of dealing with the problem caused by base compositional heterogeneity in tree reconstruction [14, 17, 56], so we performed all phylogenetic analyses on conceptually translated amino acid data of 13 mitochondrial PCGs using maximum likelihood and Bayesian inference methods. In the ML and Bayesian trees, S. erythranum displayed a remarkable long-branch, and clustered with other long-branches (Figure 7A). The AT-skew and GC-skew plot reveals that Hutchinsoniella macracantha, Habronattus oregonensis and Centruroides limpidus have a similar base composition to S. erythranum (negative AT-skew and positive GC-skew). After removing these three taxa, S. erythranum clustered with Speleonectes tulumensis (Crustacea: Remipedia), but the bootstrap value and posterior probability are relatively low, which prevent us from determining the exact phylogenetic position of the Protura (Figure 7B). We also tested the phylogenetic placement of S. erythranum by sequential taxon removal, and it consistently showed a distant affinity to the Insecta (data not shown). Maximum likelihood trees of S. erythranum and other arthropod representatives based on the amino acid sequences of 13 mitochondrial PCGs. A. 24 taxa. Numbers at each node indicate bootstrap values of maximum likelihood analysis (100 replicates). B. 21 taxa. Numbers at each node indicate bootstrap values of maximum likelihood analysis (100 replicates, BS) and Bayesian posterior probabilities (PP) in format of "BS/PP". In our trees (Figure 7), the clade of Diplura and Collembola is sister to Insecta, although the bootstrap value is relatively low. It is different from previous studies based on mitochondrial gene sequences of diplurans and collembolans, which suggested that some crustaceans are more closely related to Insecta than Collembola and Diplura . More arthropod taxa are needed to further discuss this problem. The unusual long-branch length indicates that the S. erythranum mitochondrial genomes are evolving rapidly. The population of soil-dwelling proturans is usually very small. Mutations may accumulate faster in such organisms due to the slow rate of gene flow. This also seems true for nematodes, parasitic lice and mites, in which high levels of genome diversity are commonly detected. The study on the mitochondrial genome of two diplurans also reveals that high genetic divergence existed in the morphologically uniform taxa . Whether the Protura is a real hexapod group or not has been debated for a long time . The Protura have many unique morphological characters compared with other hexapods: 1) they have no eyes and no antennae; 2) they have abdominal legs on abdominal segments 1-3; 3) they have no caudal cerci but have a telson tail, which is common in crustaceans but absent in other hexapods [1–3]; 4) the axoneme of flagellated spermatozoa lacks central microtubules, which is similar to the condition in pycnogonid spermatozoa ; 5) the serosa (embryonic membrane) of proturans retains the ability to differentiate into a tergum or definitive dorsal closure during embryonic development, which is similar to crustaceans and myriapods, but different from other hexapods. Based on information from embryonic development, Machida (2006) proposed that the Protura may have a much longer evolutionary history than previously thought . However, a few recent studies based on EST data and rRNA genes have presented relatively robust evidence supporting the monophyly of Hexapoda and Pancrustacea (although only one proturan species was included in these studies) [12, 18]. 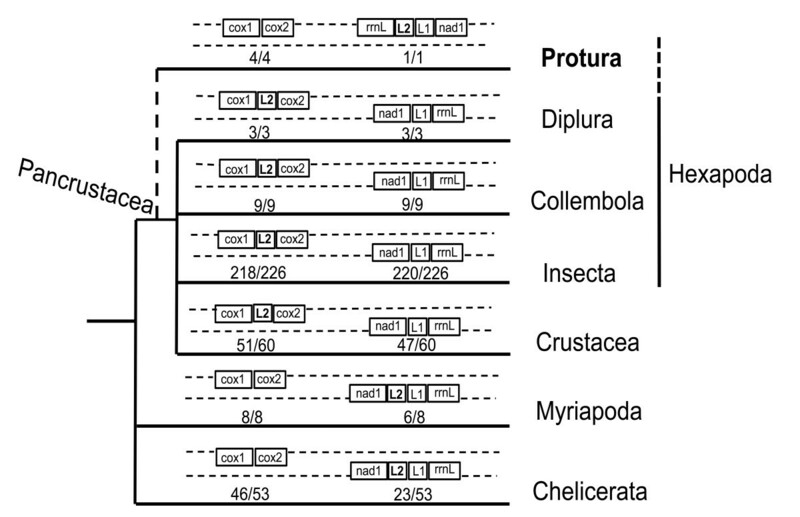 Although the mitochondrial genome sequence of S. erythranum is unique, with little phylogenetic affinity to the insects, we cannot equate this to the evolutionary history of the Protura. Mitochondrial genome data alone are not enough to unambiguously resolve the relationships of Protura, Diplura, Collembola and Insecta. It is necessary to understand the limits and applicability of these data . Our sequence data showed many unique molecular features, which can provide valuable information for studying problems of mitochondrial genome evolution, for example, the mechanisms of mitochondrial gene rearrangements, truncation of tRNA secondary structures, and nucleotide frequency bias. Understanding these fundamental biology problems should be helpful in phylogenetic analyses when using mitochondrial genomic data. This is the first report of a complete mitochondrial genome from the Protura. With highly divergent evolution, their mtDNA has many different features to that of other hexapods, including nucleotide-frequency bias, gene order, and tRNA secondary structure. Therefore, it is a valuable example to study the mechanism of mitochondrial gene evolution and rearrangement in the Arthropoda. Our study suggests that proturan mtDNAs do not agree with the "cox1-trnL2-cox2" pattern, which was thought to be an important character shared by hexapod and crustacean groups. It may be a result of secondary reversion due to extensive rapid and divergent evolution, but also may suggests that the Protura have a long evolutionary history, and do not have a close affinity to hexapods and crustaceans. S. erythranum did not group with other hexapods in our phylogenetic trees, and its extreme long-branch implies that its mtDNA underwent highly divergent evolution. More evidence is needed to verify this hypothesis and to solve the conflict between the studies on mitochondrial and nuclear gene markers. Specimens of S. erythranum were collected from Tianping Mountain (Jiangsu Province, China). The total DNA of one individual was extracted with the commercial kit Wizard SV Genomic Purification System (Promega), and then was used as the template for PCR amplifications. Initially, two small fragments of cox1 and cob were amplified using two universal primer pairs of LCO1490/HCO2198  and CobF424/CobR876 , respectively, and the PCR products were sequenced directly by the amplification primers. Four primers were designed according to these obtained sequences for two long PCR amplifications encompassing the cox1/cob (~9 kb) and cob/cox1 (~6 kb) fragments, respectively. These primers were SI-C1-J320 (CTGGTTGAACTGTTTATCCTCCTC)/SI-Cb-N239 (ATAAGGATGAAAACTAACCCTATCA), and SI-Cb-J181 (GTTCTTCTAATCCTTTAGGAGTTGG)/SI-C1-N343 (GAGGAGGATAAACAGTTCAACCAG). Long PCRs were generated with LA Taq (Takara, Dalian, China) under the following two-step conditions: 35 cycles of 96°C for 2 min and 68°C for 10 min, followed by incubation at 68°C for 10 min. The 9 kb and 6 kb products were mixed together after gel-purification, and then sequenced with the shotgun sequencing approach as described by Masta and Boore (2004) . The sequencing service was from Shanghai Majorbio Biotech Co., Ltd. Two contigs were assembled by Phred/Phrap [59, 60] from the shotgun sequencing readings, guaranteed to have 10 times coverage for both contigs. More specific primers were designed for PCR amplifications to bridge two remaining gaps (primers available on request). All PCR products were then cloned and then sequenced by an ABI 3730 automated DNA sequencer. A consensus sequence was assembled from all the contigs using Seqman in the DNAStar software package (DNASTAR Inc., Madison, WI) . The sequence was submitted in Fasta format to the web-based software DOGMA (Dual Organellar Genome Annotator)  for primary annotation. BLAST searches were done on NCBI Blast Entrez databases to ensure the identity of PCGs and rRNA genes. To identify the tRNA genes in the genome, we used the annotation obtained by DOGMA (with the COVE threshold for tRNAs set to 7(low)), and further used tRNAscan-SE via the web interface and the "Nematode Mito" settings for the COVE program . The ARWEN (version 1.2) program was also used by the web interface with the "mtmam" option switched off . Finally, the tRNAs were determined by comparing the secondary structures suggested by these different programs. Tandemly repetitive sequences in the A+T-rich region were determined both manually and by using the Tandem Repeats Finder . The putative minimum-free-energy structures of TRRs were given by RNAfold WebServer in the Vienna RNA Websuite . In order to find if trnL2 lay outside of cox1 and cox2, not only in the Sinentomata but also in the other proturan groups, we amplified and sequenced the cox1/cox2 junction (about 1.4 kb) of B. tianmushanensis (Acerentomata: Berberentomidae), E. nivocolum (Eosentomata: Eosentomidae) and Z. piligeroum (Eosentomata: Eosentomidae) using the universal primer pair C1-HCO-J and C2-B-3665 . We followed the above-mentioned methods to annotate these genes. We retrieved the nucleotide sequences and DNA compositions for all 359 published arthropod mtDNAs (before January 16, 2011) from the Mitome database  or NCBI Organelle Genome Resources. Strand asymmetry represents strand compositional bias, usually reflected by the AT skew = (A-T)/(A+T) and GC-skew = (G-C)/(G+C) [32, 68]. We further checked the position of trnL2 in all 359 available arthropod mtDNAs. For the pancrustacean groups, we checked whether each mtDNA agreed with the typical patterns of cox1-trnL2-cox2 and rrnL-trnL1-nad1; then, we did the same for the other arthropods, the myriapods and chelicerates, which typically have the different pattern of cox1-cox2 and rrnL-trnL1-trnL2-nad1 . First, we choose 24 Panarthropoda representatives (Additional File 3) for phylogenetic tree construction based on previous studies [14, 17], including three groups with the similar base composition to S. erythranum (negative AT-skew and positive GC-skew, Additional File 4), in order to see if S. erythranum will group with them because of LBA. Then, we reconstructed the phylogenetic trees after removing these three taxa, focusing on the relationship of S. erythranum and other hexapods. The onychophoran Opisthopatus cinctipes was defined as the outgroup in our analyses. The nucleotide sequences of each PCG were retro-aligned using DAMBE, version 5.1.1 . The 13 amino acid data were concatenated as an alignment of 3819 positions after individually aligned, and then, 2520 aligned characters for 24 taxa and 2616 aligned characters for 21 taxa were retained respectively after Gblocks screening with default settings . The best model "mtREV24+G+I+F" was selected using MEGA 5.0 . We carried out ML searches with RAxML through the web portal http://phylobench.vital-it.ch/raxml-bb/index.php. Bayesian analysis was performed using MrBayes (version 3.1.2), with mtRev+I+G model . Four Markov chains were run for 1,000,000 generations, and sampled every 100 generations to yield a posterior probability distribution of 10,000 trees. The first 2,000 trees were discarded as burn-in. The standard deviation of split frequencies was lower than 0.01 in 21 taxa dataset analysis, but we failed to obtain a meaningful convergence for the 24 taxa dataset. Wan-Jun Chen, Yun Bu contributed equally to this work. We are grateful to Jon Mallatt from Washington State University and Yonggang Yao from the Kunming Institute of Zoology, CAS who kindly offered critical comments and valuable suggestions on the manuscript. We also thank two anonymous referees and the Associate Editor for helpful comments on the manuscript. This work was funded by grants from National Natural Science Foundation of China (No. 30870282, 31071911), and Innovative Program of The Chinese Academy of Sciences (No. KSCX2-YW-Z-0930). WJC carried out most of the experimental work, performed the molecular analyses and drafted the manuscript. YB sampled the specimens, participated in the molecular experiment and data analyses. AC analyzed the data and drew tRNA structures. RD, SL, WYY provided intellectual contributions during the implementation of this study. YXL supervised the study, analyzed the data and wrote the manuscript. All authors read and approved the final manuscript.